CALL AND ASK FOR ONE OF OUR PARTNERS FOR YOUR FREE CONSULT. NO FEE GUARANTEE POLICY. IF WE DON'T WIN, YOU DON'T PAY. 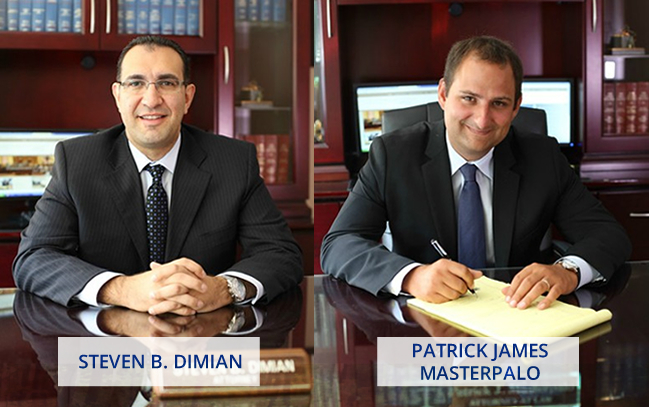 Top personal injury accident lawyers Steven Dimian and Patrick Masterpalo formed Dimian & Masterpalo Attorneys At Law because of a shared a common goal: to use their combined skills and expertise to passionately – and successfully – fight for the rights of those injured in auto and slip and fall accidents.